Fresh breath is a sign of a healthy mouth. Proper oral hygiene is key to boast a beautiful and healthy smile and a fresh and lasting breath. 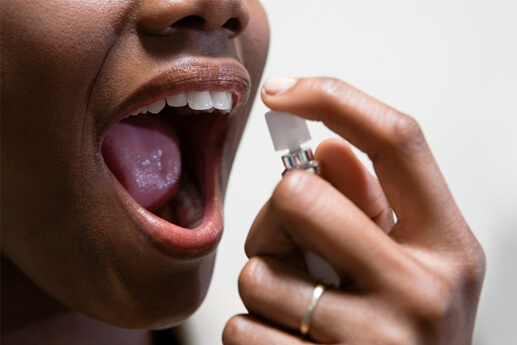 An easy way to know if you have good breath or bad breath (halitosis in medical terms) is to check your tongue. If these are pink and bright color, it is a good sign; if it appears whitish and flaky, some remedies should be adopted to complete hygiene and refresh the mouth. Take note of these simple natural remedies to combine with dental hygiene and to compensate for dryness or aftertaste that can leave some food in the mouth, entrance door of the bad breath. Thyme served for bad breath. A plant with which we can prepare a natural toothpaste. It is made with three tablespoons dried thyme, 3 tablespoons green clay, a pinch of sea salt and a jet of infusion of sage. This paste can be stored in the refrigerator. Peppermint is good for bad breath. To complete the cleaning of the mouth rinses test to be performed with an infusion of peppermint, lemon balm, rosemary, sage and anise seeds (the ratio is one tablespoon of the mixture per cup of water). This natural remedy is especially recommended when bad breath is caused by digestive problems. Chamomile with lemon is a recommended remedy in case of bad breath due to dry mouth. It is necessary to remember that one of the best remedies to avoid the problems of halitosis is to drink a lot of water (at least two liters on the per day of liquid). Most oral problems (dryness, decay …), digestive (heartburn, gas …) and respiratory (strep throat, sinusitis …) can cause bad breath as a result of lack of hydration. For these cases, the best ally is an infusion of chamomile and mallow (a tablespoon of the mixture per cup of water) and a splash of lemon. Specifically, cloves, an ancient plant that also refreshes. Just chew on this species, which is also a powerful disinfectant. In herbalists and pharmacies, we can find oral sprays to get fresh breath. Tea tree and grapefruit seed extract with antiseptic properties included in its composition. There are more likely foods to cause bad breath. In the case of garlic or onions. To prevent its flavor will endure in the mouth a remedy is chewing parsley or coffee beans. In the case of strong cheese or blue cheese, which can leave an aftertaste in the mouth that causes bad breath, combine these foods with more juicy, like citrus, tomatoes, pineapple, lettuce or celery.